Cleanses the intestines and kidneys. Support for metabolism, the intestines and digestion. 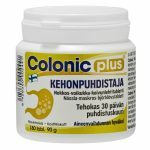 Colonic Plus contains beneficial herbs that activate the metabolism, intestines and digestion together acting as a diuretic. 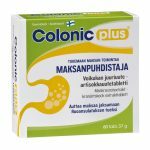 The product is recommended especially for those who want to cleanse their body. Contains all the important enzymes for digestion. Enhances digestion and is recommended to be taken together with heavy meals. Does not contain any ingredients of animal origin. For gut health, brain, muscles and cells. Inulin is a natural prebiotic produced from chicory root (Cichorium intybus) by using hot water extraction. Inulin maintains a favourable bacterial flora in the intestines. Inulin is nature's own way of storing energy in a form without almost any calories (only 1 kcal/g). Only the beneficial bacteria of the human organism is able to utilise inulin. By its chemical form inulin is a fructose polymer (FOS or fructose oligo saccharide). Inulin has a positive bifidogenic influence in the intestines and it cleans out the intestines by reducing the amount of harmful intestinal bacteria and thus leading to a healthier bacterial flora. 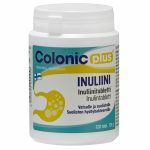 One Colonic Plus Inuliini tablet contains 1000 mg of inulin. 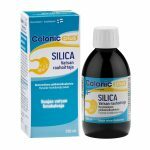 Unsweetened and unflavoured silicon product in and easy-to-take form for the well-being of the stomach. The manufacturing process uses a very fine-grained silicon dioxide that has been dispersed into demineralised water in a ratio of 1:35. Digestive enzymes for heartburn and stomach acidity problems.